Today's post is first of all my excuse for being so inactive recently. 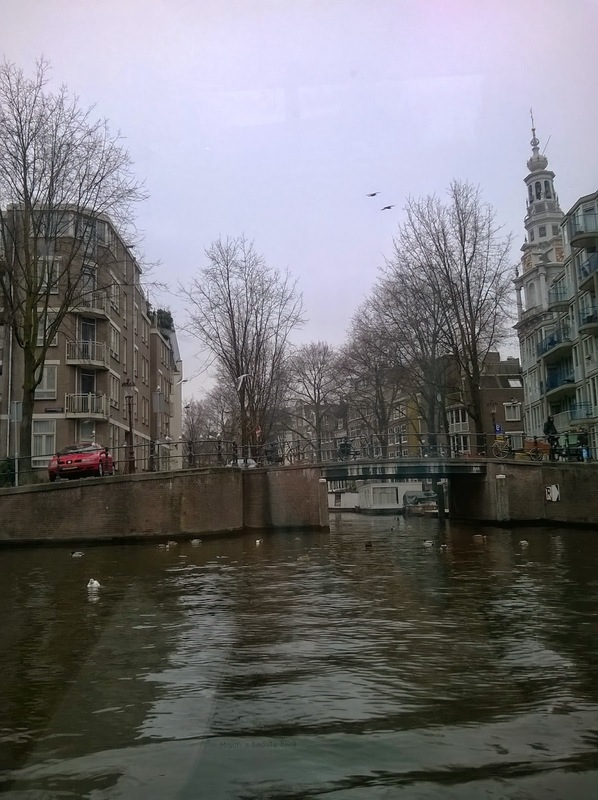 I went on a city trip to Amsterdam, and now I would like to share some travel tips with you guys. Travelling on a budget isn't always easy, because there's so many factors that need to be paid for: accommodation, transport, activities, food, and the likes. But with a bit of research and the willingness to accept somewhat low standards, it's definitely possible. Let me say straight ahead that when I travel, I don't have high expectations as I mostly go for the cheapest versions. That's a compromise I'm willing to make, because especially when you're young, it's well worth the money you're saving and therefore able to spend on something else. Just be warned that the level of comfort might be below what you usually go for. 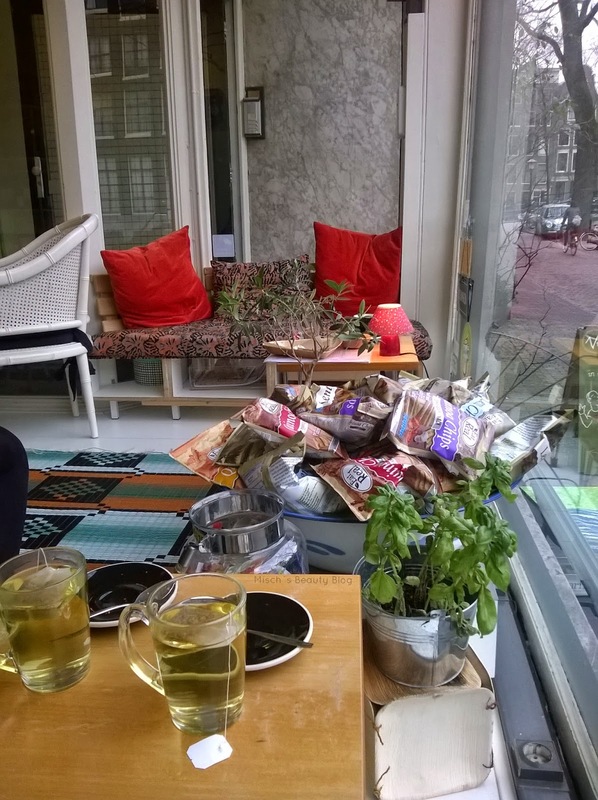 Now, let's talk about Amsterdam! First of all, how do you get there? You (pretty much) have 4 possibilities: with your own car, via bus, via train or via plane. What to choose depends on where you're coming from. Living overseas doesn't give you much of a choice, but when you're travelling within Europe, I can highly recommend going by bus, as it's the cheapest alternative. The one we took was from megabus.com, and it went all the way from Munich to Amsterdam, with stops in Stuttgart, Frankfurt, Cologne, Brussels, Antwerp, Rotterdam and Amsterdam. Downside: many stops equals a long driving time, 16 hours in our case. Upside: incredibly cheap with 20€ to get there, and 25€ for the ride back, as it was on the weekend. Plus, it was surprisingly comfortable for the price, and we were able to get some sleep. 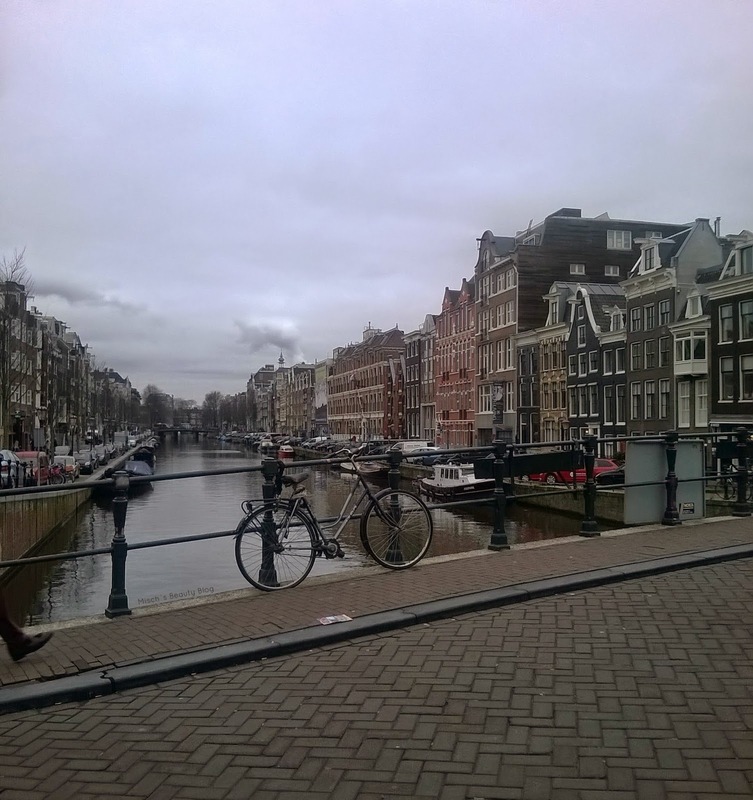 Amsterdam has plenty of hostels to stay at. Hostelworld.com helps you find them, and we picked the Central Station Hostel. Located perfectly within the city centre, everything is in walking distance. The rooms are fine with bunk beds and a bathroom ensuite. You have lockers and free wifi, and very helpful staff. We paid 9,99€ per night for a 10 bed mixed dorm, a price you really can't complain about. Be aware that weekend and holiday rates are quite a bit more pricey, so go during the week if you can! One thing you need to know about this hostel is that they have very steep stairs that you have to climb to get inside, they're almost as steep as a ladder. Van Gogh Museum: a must if you're a fan of the painter. 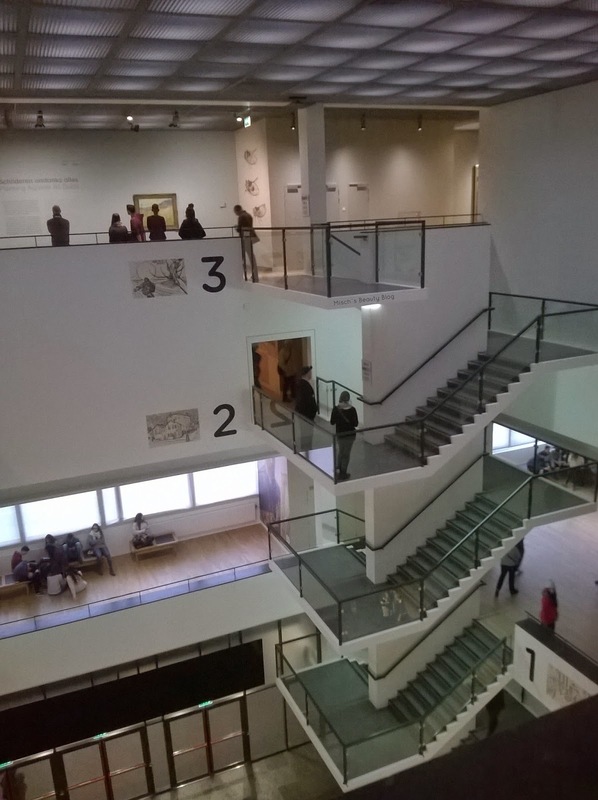 It's a very nice museum, very well-structured and not overwhelming. Admission: 15€ if you're 18 or older. I liked it a lot and think it was worth spending the money, but you definitely have to be a fan of Van Gogh's work to enjoy it thoroughly. 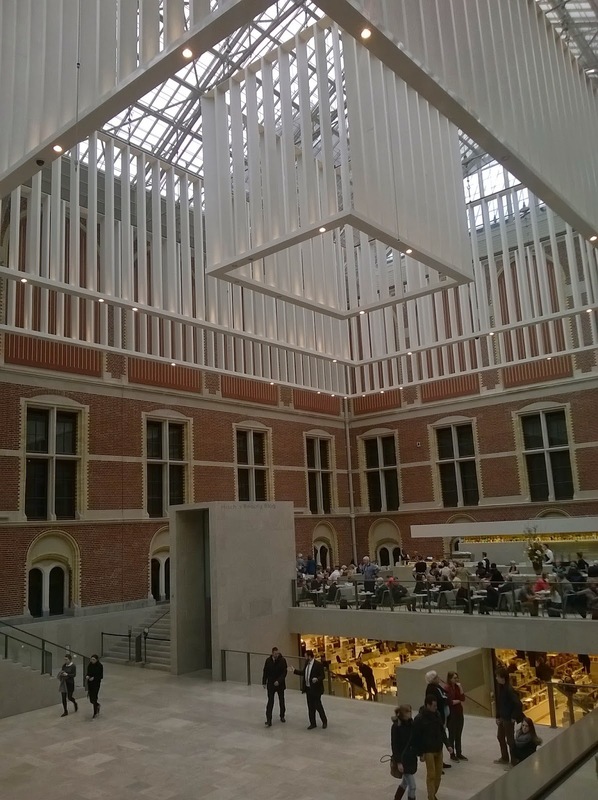 Rijksmuseum: it's the national museum, and quite a big one. Contains various types of artwork, but not too much of modern things. 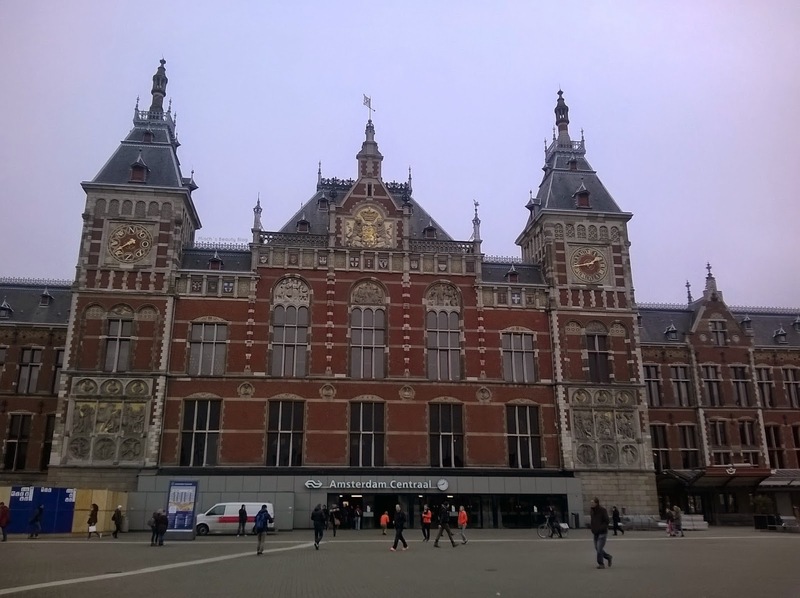 Great exhibitions on the Dutch golden age in the 17th century. Lots of Rembrandt, Rubens and Vermeer. Admission is 17,50€ for adults, but if you're still 18, you can enter for free. That's why we did it, but I don't think I would pay the full price. If you like to have a look at the stunning interior, though, you can simply go in and look around without buying a ticket. There's also a café. 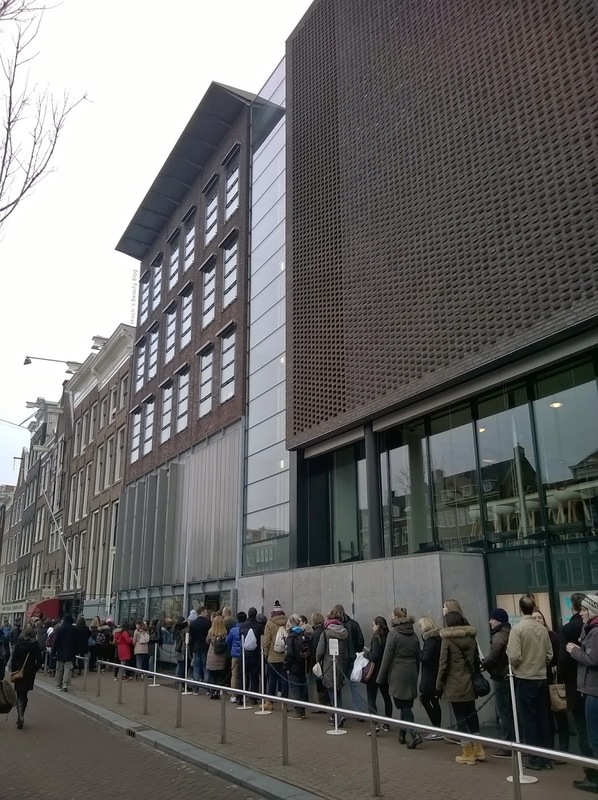 Anne Frank House: this is something you really shouldn't miss. Shows Anne Frank's hiding situation and lots of background information in the actual house they hid in. It's not made in a depressing way, but wholly honouring and thought-provoking. Admission: 9€ for 18 and older. Coster Diamonds: Amsterdam is well-known for its diamond factories. Coster Diamonds is the oldest, and you can take a free tour through the building to see diamond cutting and learn different facts. The biggest part of the building is the shop where you can buy anything you wish for. The tour wasn't exactly long and somewhat rushed, but it was interesting nonetheless. And free! 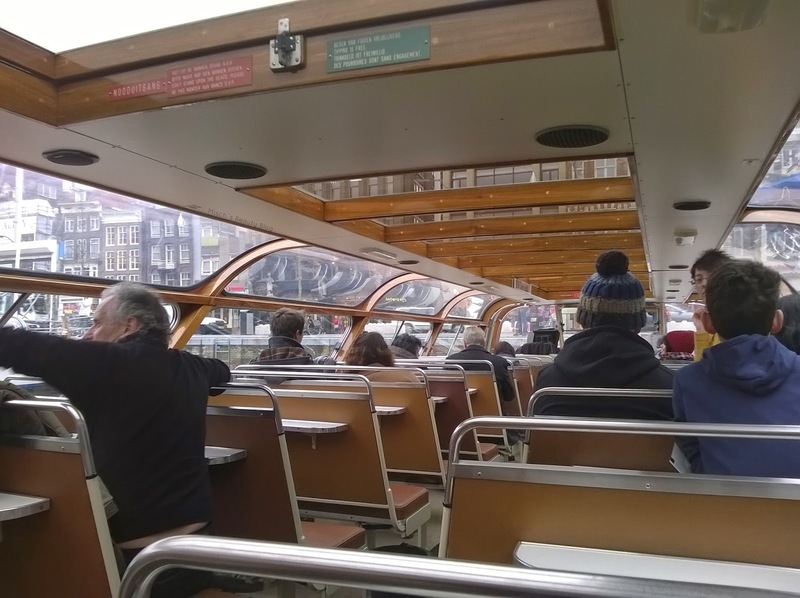 Canal Cruise: a canal cruise is a great way to get an overview of the city's main places and sights, and be told some interesting facts by the guides. Also it makes for a different perspective to see everything from the water. At the Rederij Plas we paid 9€ for a cruise, and it was about 55 minutes long. With different places, prices can range between 9 and 16€. 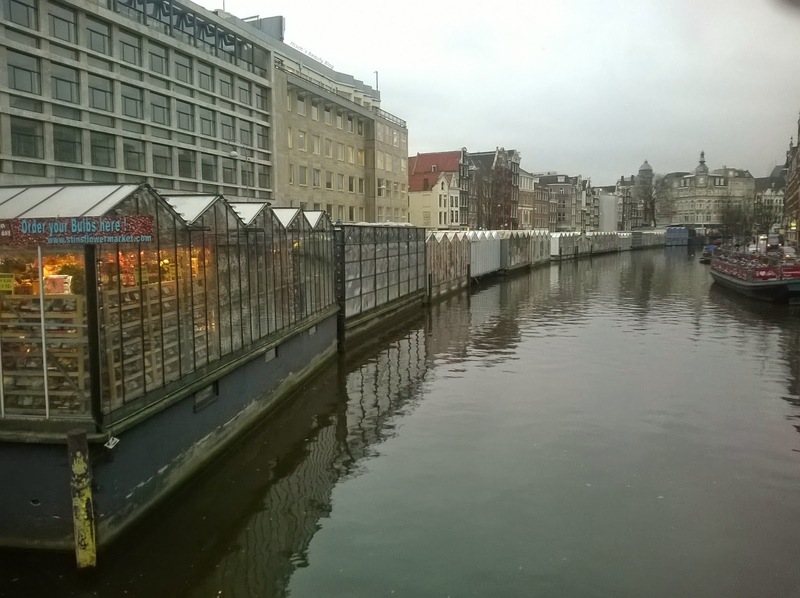 Flower Market at the Singel: a great flower market that is partly built over the water of the canals. 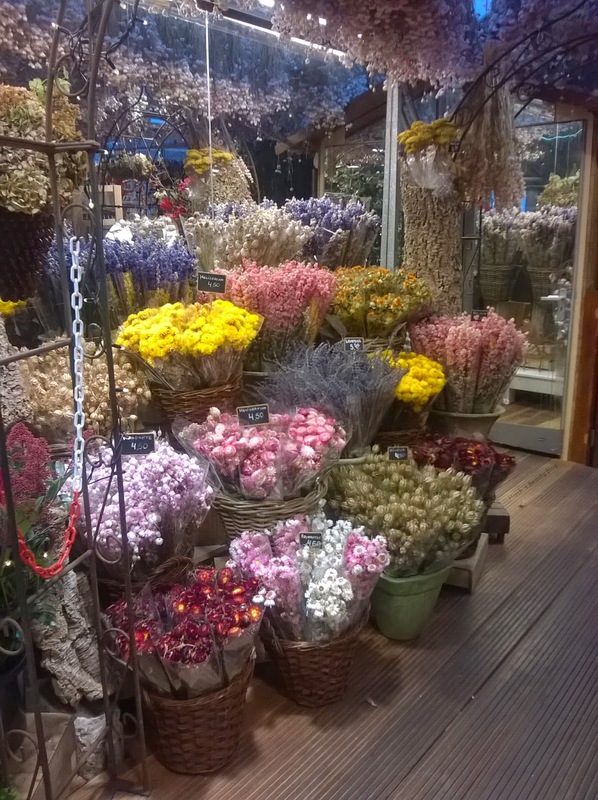 Lots of beautiful flowers to see, though at this time of the year they mainly had tulip bulbs there. Still, worth a visit, and it takes place every day. 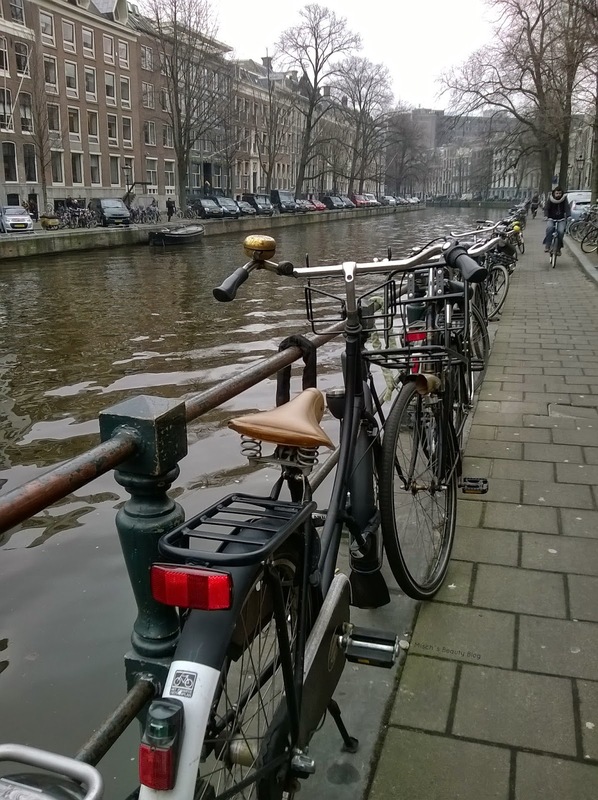 Bicycle touring: Just like the whole of the Netherlands, Amsterdam is a great place for cycling. You can rent bikes at lots of places, and prices are something around 6€ for 3 hours and 9€ for a full day. Rent-a-bike is located directly next to the hostel I mentioned above, and the bikes are also equipped with 2 locks. There are bicycle paths throughout the whole city, but at the road management can be a little hard to understand at first. Don't go to fast and always check for pedestrians and cars to be save! 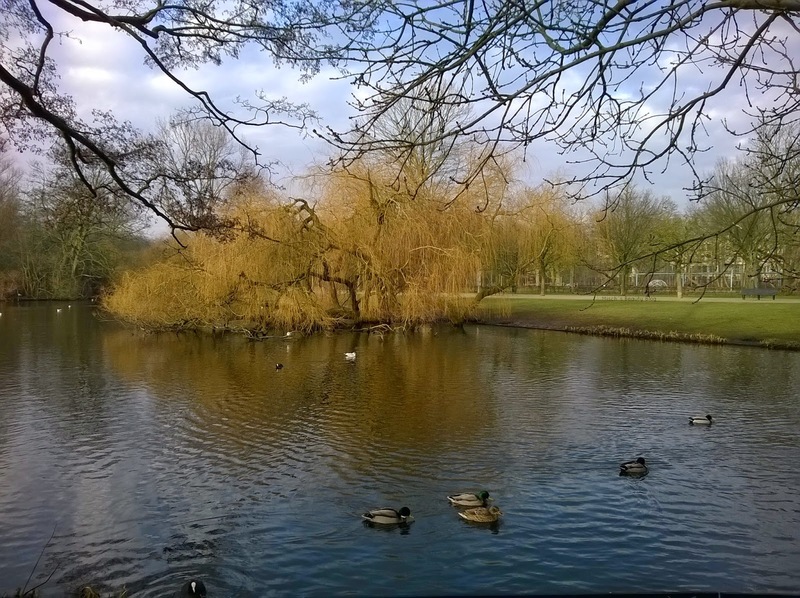 Something that is also great fun is cycling in Vondelpark. This concludes the main activities we did during our time in Amsterdam. Other than that, I can really recommend just to go out and walk around. You can see so many interesting things, and the houses along the Grachten are the best things. They always look great, whether it's day or night. What's especially great at night is that you can see inside many buildings because of the huge illuminated windows. Lots of fun, I promise! And you can always discover new spots, it doesn't get boring fast. Next, let's talk about food. The main Dutch supermarket chain is called Albert Heijn, and you can find some stores downtown. They have a great selection of fresh fruit and vegetables, baked goods and snacks. Something I can highly recommend is their selection of freshly squeezed juices, called Versgeperst, as well as the smoothies. Had some every day because they were so good! And also not too expensive, around 2€ for 500ml. Generally, food is not too expensive. 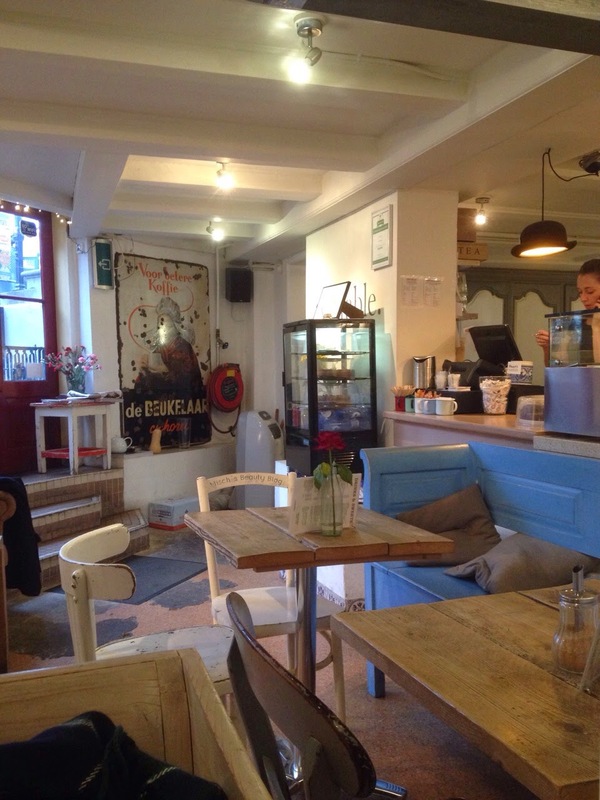 If you want to eat out, there are many cute cafés to choose from. We didn't go to any actual restaurant but rather did late lunches in those cafés. 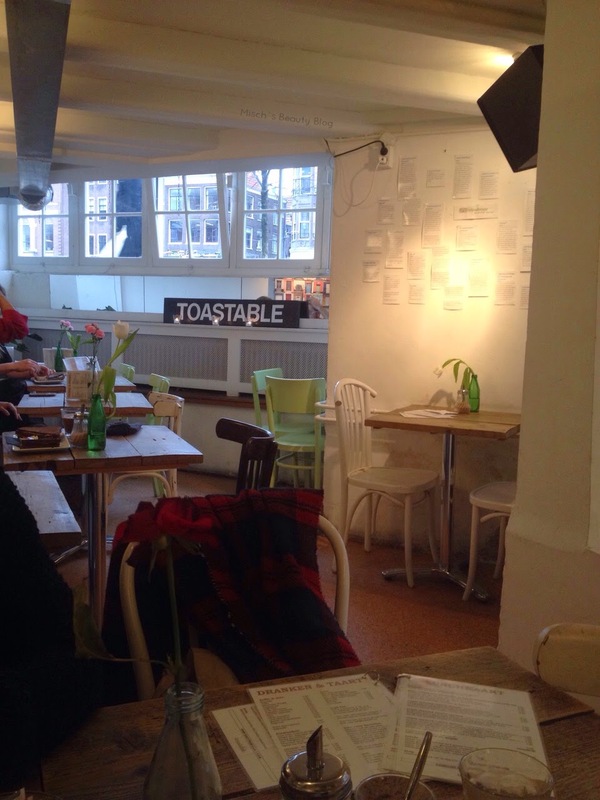 The first one I'd like to recommend is called Toastable, and it's located in the souterrain at the Singel. 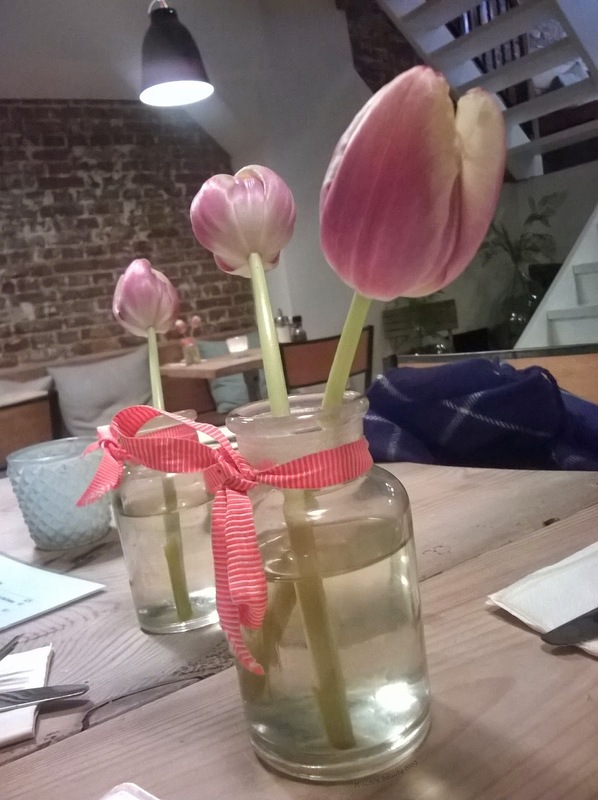 A very cute place, very cosy and with lovely staff. To eat, they mainly have sandwiches and soup to choose from. Prices range from 5 to 8€. Warm drinks are about 2-3€. 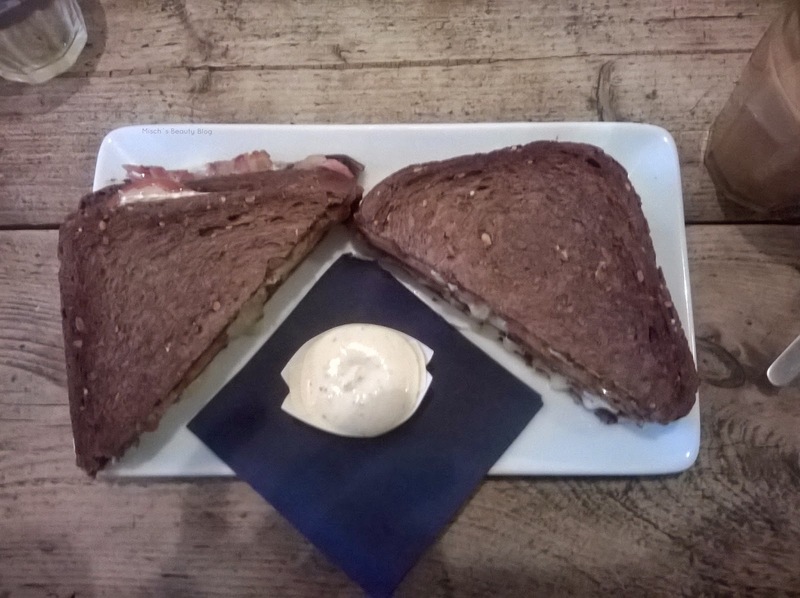 What you can see in the picture is a wholegrain sandwich with brie, tomatoes, bacon and a honey-mustard-mayonnaise. Next up I have Vegabond to introduce to you guys. 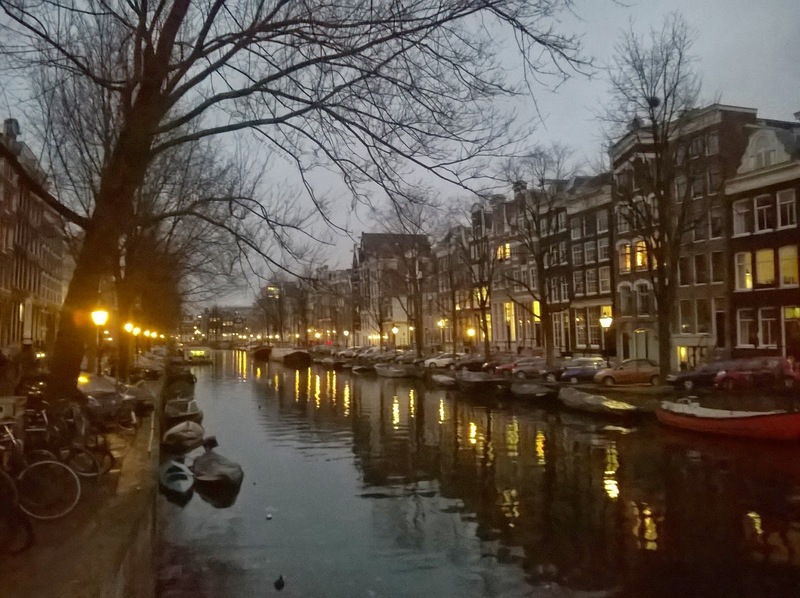 which is located at the Leliegracht. 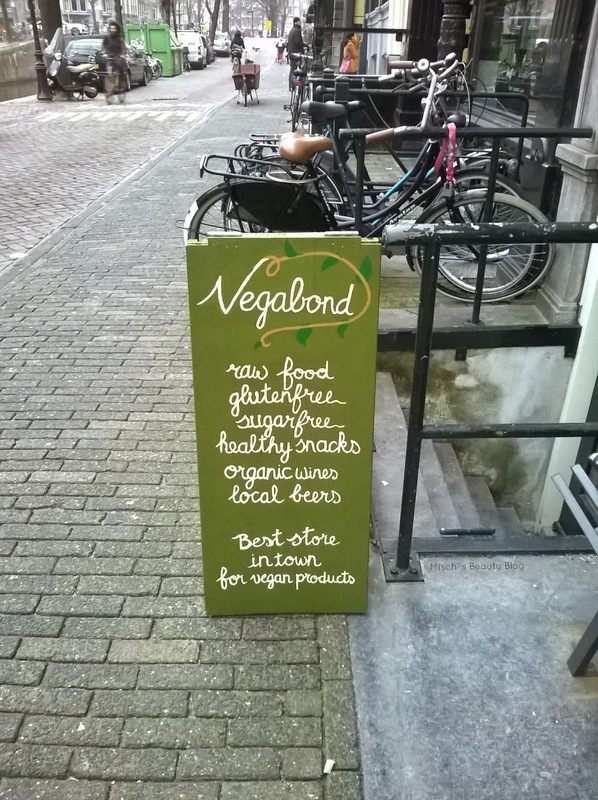 Totally vegan, and not only a café but also a place to buy all kinds of vegan groceries. 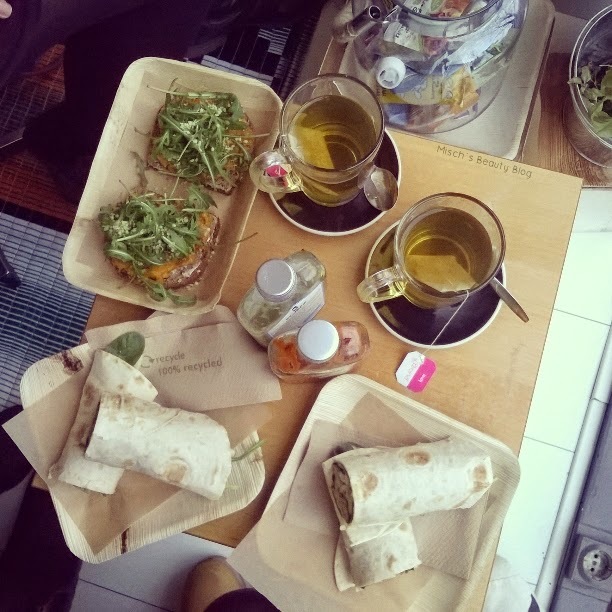 Their wraps and sandwiches cost between 5 and 6€, and warm drinks are around 2-3€. 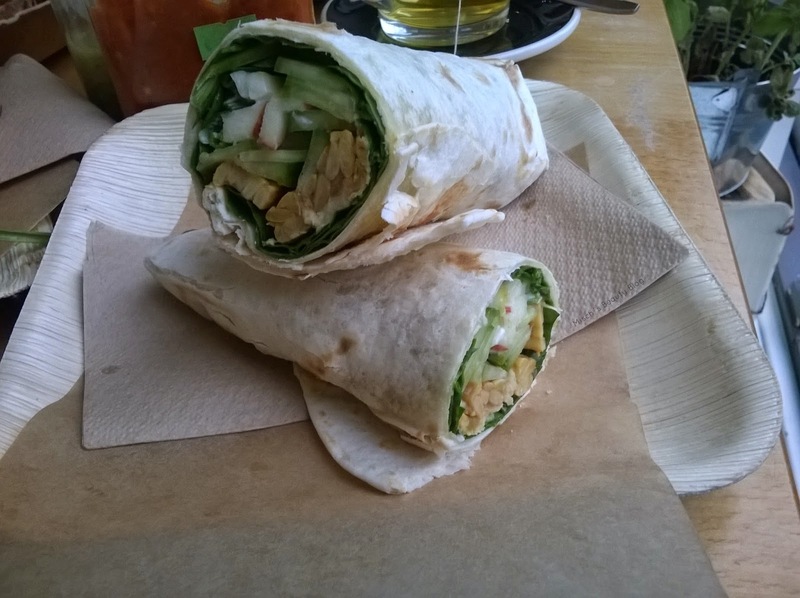 What I had was a wrap filled with apple, cucumber, dates, spinach, tempeh and vegan mayonnaise. 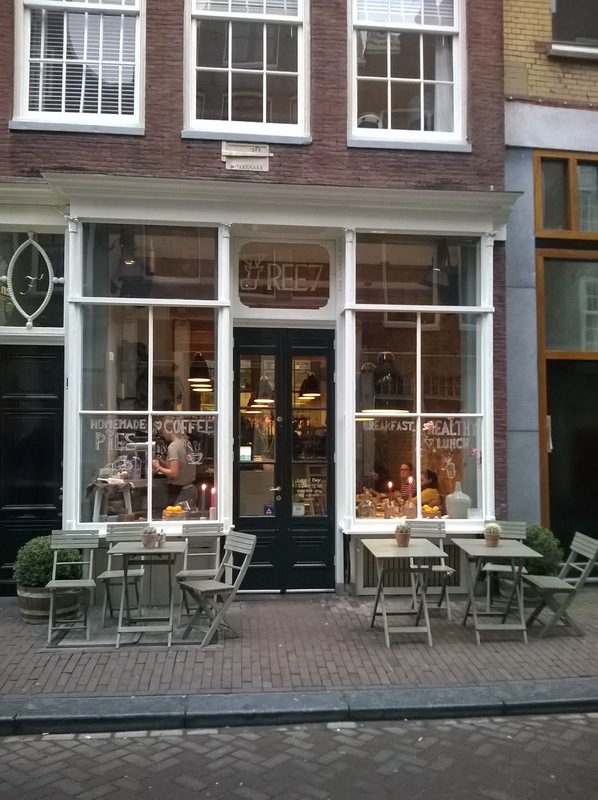 The last café I have to show you is called Ree7, and located at number 7, Reestraat. 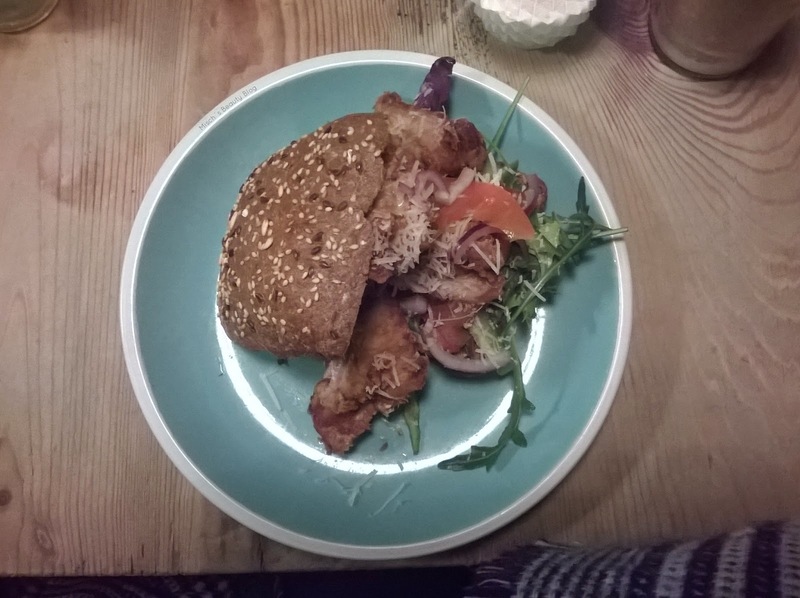 Its selection of meals is a bit bigger, including not only sandwiches but also different salads and other small meals. Their prices are a bit higher, at 7-9€ for a sandwich, and 4-5€ for cakes and pies. It's at the upper limit, but we still enjoyed our lunch there. The interior is very cute. 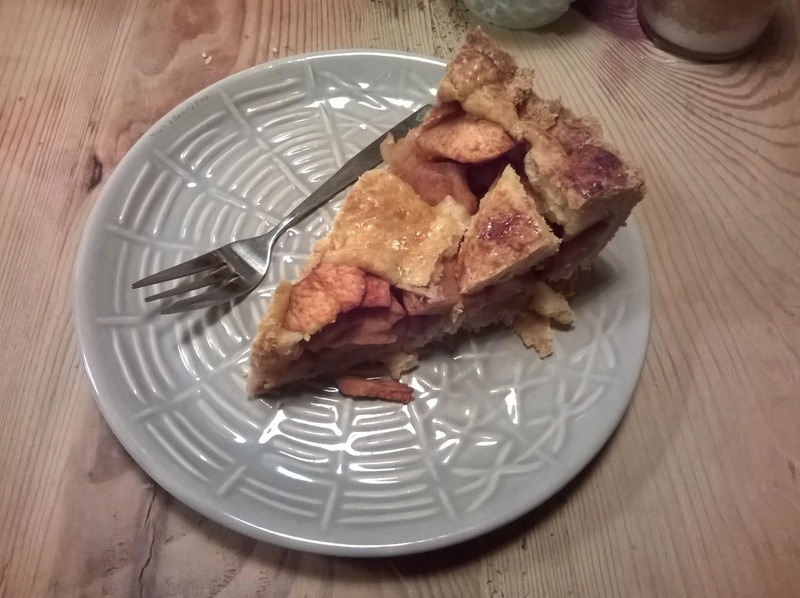 I had wholegrain sandwich (which was more of a roll) with avocado, rocket, tomatoes, parmesan, chicken and onions, as well as an apple pie. Generally, the selection of cute and more alternative cafés is huge, and you can find many lovely places a bit off the main tourist areas. In those, you can find any type of fast food and take away place you can imagine, and also not too over-priced. Amsterdam is also famous for its fries, which you can order with many special dressings. If you're looking for another obvious fact to go to Amsterdam, it's the fact that marijuana is legally sold here. I didn't try it, but you can smell it at every corner of the city, at any time of the day. It's not hard to come by and, should you be interested, easy to try in the various coffee shops. 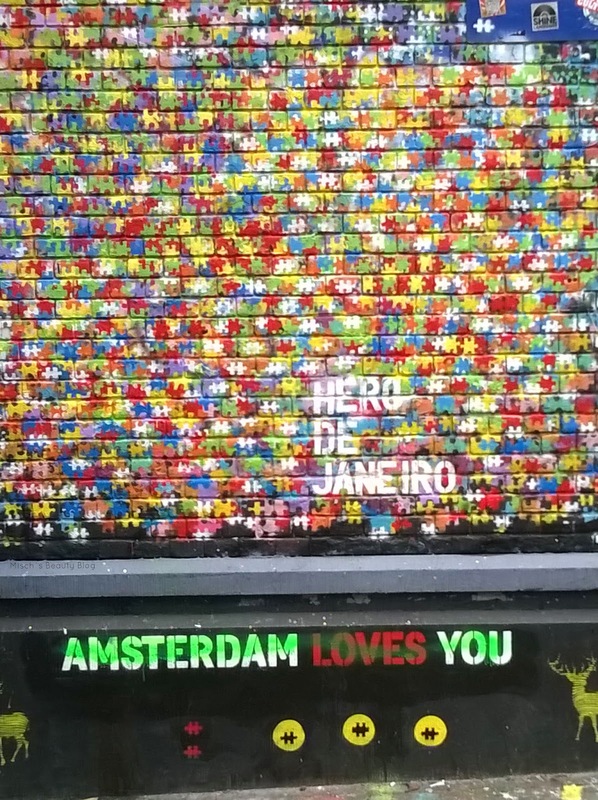 I can highly recommend for you to travel to Amsterdam. It is a lovely city with many great things to see. 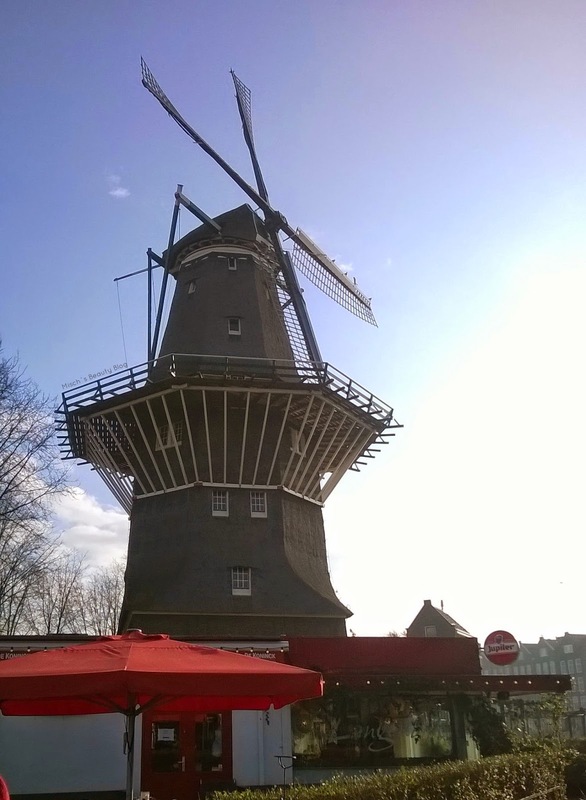 The Dutch are incredibly friendly and helpful, and you're sure to have a good time. It's not hard to enjoy yourself even when travelling on a budget, because the possibilities are endless. It might not be your cheapest city trip ever, but it's more than affordable. And so worth it! I loved it there, and will most certainly go back. 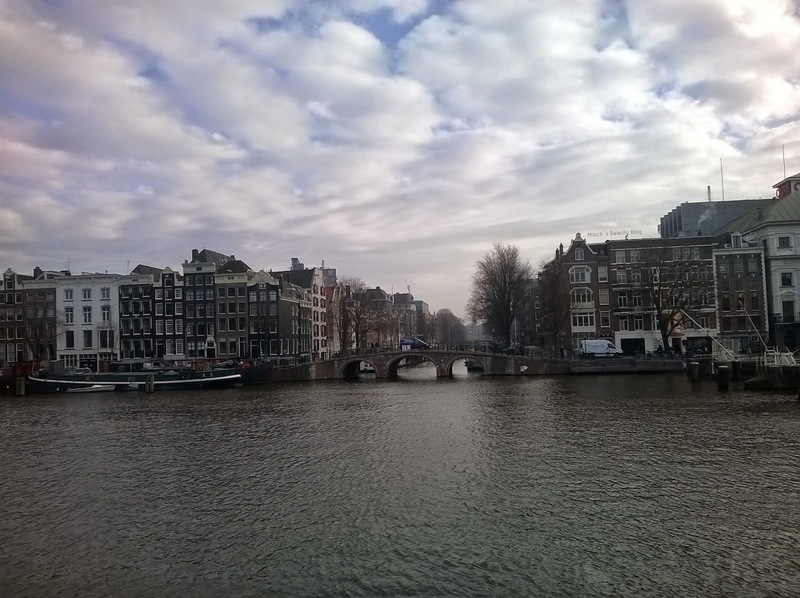 Has anyone of you ever been to Amsterdam? And how do you manage to travel on a budget? Let me know! We were there a couple of summers ago. We stayed in a hotel outside the centre, the Casa 400 that had been a dorm years ago. Those restaurants look great. That sounds great! What was it like in the summer?